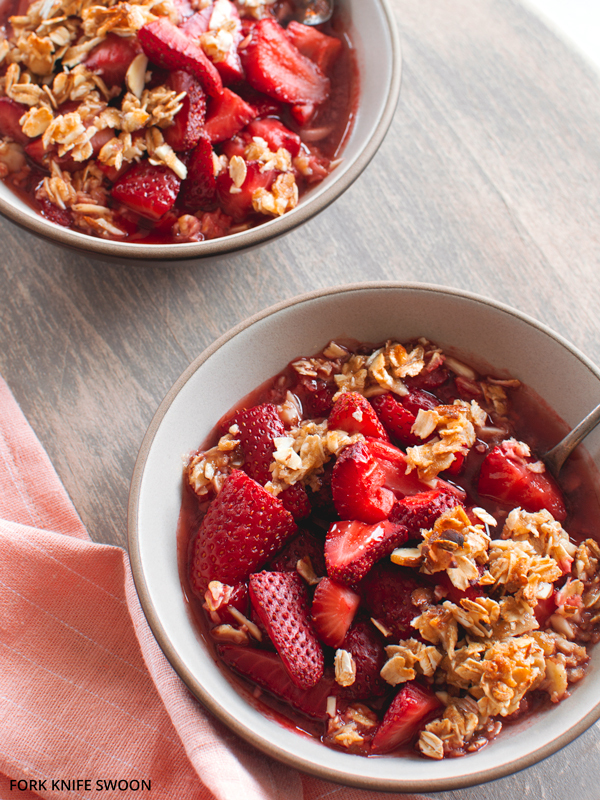 Simple fruit crisps and crumbles are some of our favorite summer desserts. They’re a breeze to make and let the full-bodied flavors of perfectly-in season fruit shine. 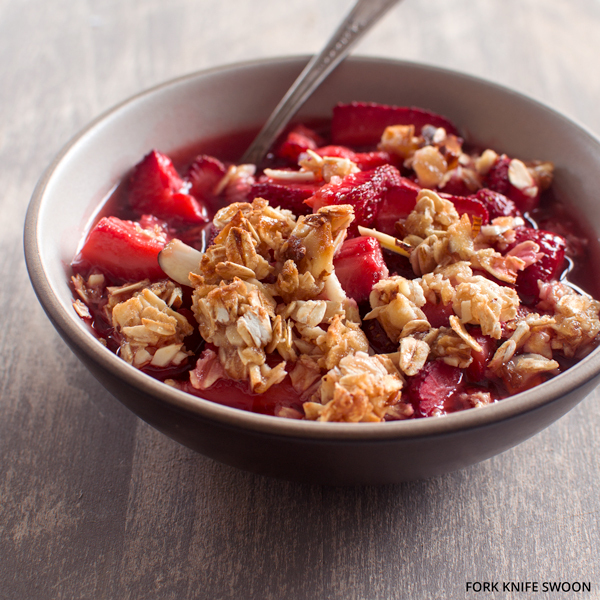 My go-to fruit crisp recipe is quick and simple; the topping is a quick mix of old-fashioned oats, chopped almonds, a bit of brown sugar and a drizzle of honey, that stays crispy through the baking process. In a couple of weeks you could swap in fresh cherries, and later in the summer you could try other berry varieties or stone fruit, but right now, strawberries reign supreme and I’m taking advantage of our local season while it lasts. Preheat oven to 350 degrees. Add the strawberries, sugar and lemon juice to a mixing bowl and stir to combine. 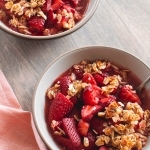 Pour the strawberries into a shallow baking dish or divide evenly among four ramekins or oven-safe bowls. Meanwhile, make the crisp topping. Stir together the oats, almonds, brown sugar and honey in a mixing bowl until well-combined. Crumble the crisp topping over the strawberries. The topping should remain slightly clumpy. 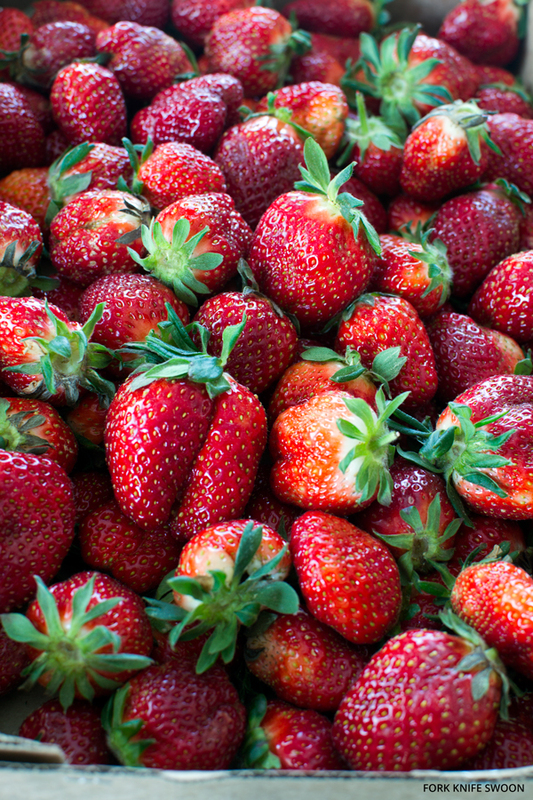 Bake for 20-30 minutes until the tops are golden brown and the berries begin to bubble. Serve warm with a dollop of whipped cream or ice cream, as desired. I just found your blog and I’m in love. These are so gorgeous!